What explains our continuing fascination with aliens? Wandering (or was it wondering) around the British Library’s excellent Out of this World exhibition, I was struck by the long and deep debt the current cultural obsession with UFOs and ET visitors owes to the imagination of science fiction writers. Virtually all the key themes that occur in the post-1950 UFO literature – from disappearing planes to alien abduction and mind-control – were anticipated decades before the flying saucer age, both in visual media and in novels and short stories published by magazines such as Amazing Stories (founded in 1926 by Hugo Gernsback). 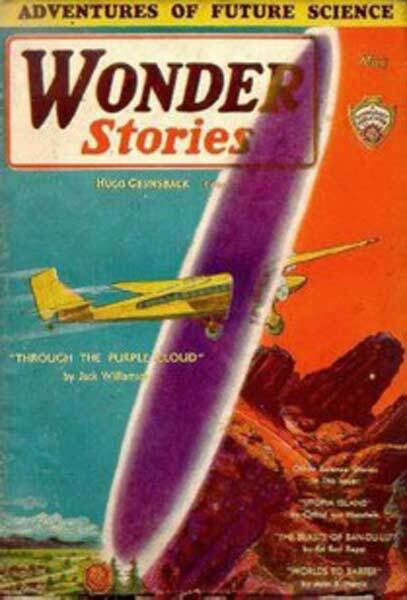 To give just one example from the BL exhibition, two short stories published by Wonder Stories eighty years ago – Clark Ashton Smith’s ‘The Dimension of Chance’ (1932) and Jack Williamson’s ‘Through the Purple Cloud’ (1931) – feature the motif of disappearing planes. In Williamson’s story the purple cloud is a portal to another dimension. It appears from nowhere and swallows the plane and its passengers, transporting them to a strange alien world. Post-WW2 the link between UFO sightings and the mysterious disappearance of aircraft and ships re-emerged in a ‘non fiction’ context in Harold Wilkins’s Flying Saucers on the Attack (1954). By 1965 there were enough real examples for Vincent Gaddis to write Invisible Horizons, the book that launched the the ‘mystery’ of the Bermuda Triangle. Subsequently, self-declared UFOlogist Steven Spielberg used the disappearance of Flight 19 as the inspiration for the opening scene in his film Close Encounters of the Third Kind (1978). Included in the ranks of early SF writers were key figures who helped to lay the foundations for the UFO myth – names such as Ray Palmer, Desmond Leslie and Brinsley le Poer Trench (Lord Clancarty), who wrote SF short stories before turning his attention to flying saucers from 1954. Sandwiched between my presentation and the Cohen & Stewart show was Mark Pilkington’s talk on the use of the UFO/alien meme by governments and intelligence agencies. This complemented the “aliens in popular culture” theme nicely, but collectively only served to emphasise the impression that, when it comes to science fiction and science ‘fact’, it’s a case of ‘never the twain shall meet’. Unfortunately, as the talks overran the time allowed, there was no opportunity for the speakers to discuss this dichotomy among themselves, or take questions from the audience, that would have allowed us to develop these issues. This elephant in the room was also noted in a review posted on Scholars and Rogues, where wufnik writes that: “Aliens have been a recurring themes in the science fiction of the post-war decades, and like other memes, often represent the political and cultural world that surrounds their literary or celluloid creation”. In other words, our changing ideas of alien appearance, origin and motives reflect contemporary preoccupations and obsessions. Our imagined visitors are, in effect, us – as evident from one of the highlights of the exhibition, H.G. Wells’s short story, “Man of the Year Million”. 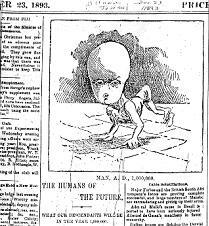 Writing in 1892, the master of science fiction stories speculated that mankind was slowly losing ape-like traits and ultimately would evolve into a humanoid form with “a larger brain and a slighter body”. In effect creatures very much like the “greys” depicted in today’s UFO and alien abduction literature. If you are visiting central London before 25 September and have any interest in these subjects, make the free Out of This World exhibition top of your things to do. The displays are broken into thought-provoking themes that include Alien Worlds, Parallel Worlds, Virtual Worlds and – finally – the End of the World. 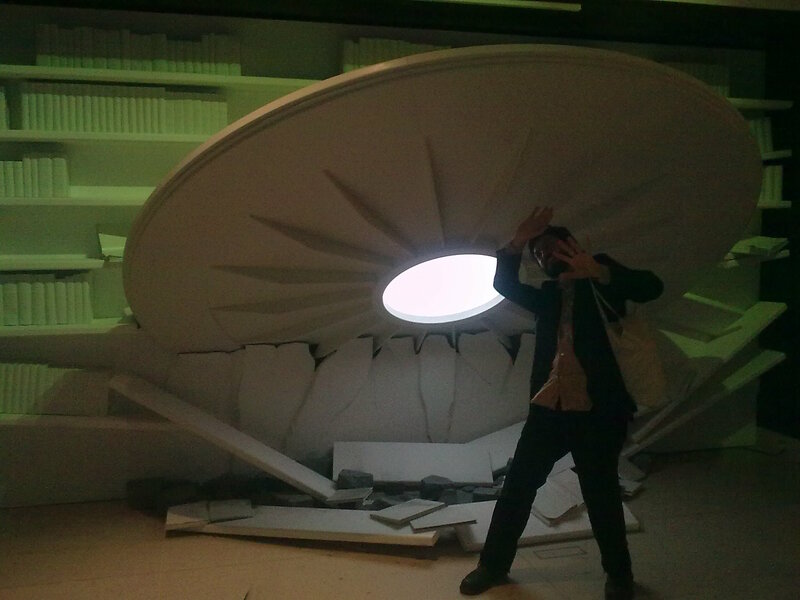 The last display brings together images of apocalypse, alien invasion and future dystopias imagined by fiction writers. For information on the events programme and opening hours, visit the British Library website here. The exhibition is complemented by Mike Ashley’s wonderful illustrated book Out of this World: Science Fiction but not as you know it (British Library, 2011) available in hardback and paperback from the exhibition shop. The book gives a comprehensive overview of how science fiction writers have responded to the impact of science, technology and socio-political change from the earliest times to the present day, with illustrations drawn from the British Library’s collection of first-edition books and magazines. This entry was posted in Uncategorized and tagged Alex Fitch, aliens, Amazing Stories, Arthur C. Clarke, Bermuda Triangle, British Library, Close Encounters of the Third Kind, Flight 19, Gareth Edwards, Gwyneth Jones, Jack Williamson, Mark Pilkington, Mike Ashley, Monsters, science fiction, steven spielberg, Through the Purple Cloud, Wonder Stories. Bookmark the permalink. One quick note – the Scholars & Rogues article you reference was penned by wufnik. Tim Hetherington is featured in our masthead as an honoree for his coverage of Afghanistan. Thanks for the link. Sadly, it wasn’t Tim Hetherington who did the post, but me. Hetherington probably would have done a better job, but he’s no longer with us. Thanks for the correction, you’re fully credited now!